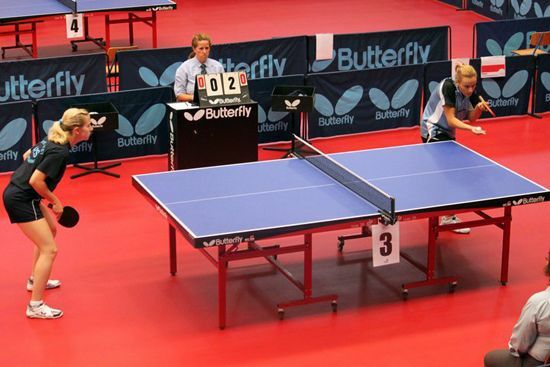 This year, the 5th European Universities Table Tennis Championship was organised in Madeira in Portugal between July 19 and 23. The competition hosted 16 men teams and 8 women teams from 9 European countries. The Opening Ceremony was attended by Dr. Ricardo Gonçalves, administrator of the University of Madeira’s Social Services, Dra. Carla Abreu, administrator of the University of Madeira, Dr. Juan Gonçalves, representing Madeira’s Table Tennis Association, Dr. Jorge Carvalho, Head of Madeira’s Regional Youth Board, Dr. Pedro Calado, representing Funchal’s City Hall, Dr. Gonçalo Gouveia, representing the University of Madeira, and Dr. Hélder Cardoso, representing Madeira’s Regional Government. On behalf of the Organizing Committee participants were welcomed by the Head of the Organizing Committee, João Baptista. EUSA EC Delegate Mr. Oleg Matytsin welcomed all participants and wished all the best for the athletes and officials who came to test their skills and abilities. He also thanked the Organizing Committee for all their contribution. The competition is organized by the University of Madeira with the contribution of the University of Madeira’s Students Union and the Academic Federation of University Sports. The University of Madeira’s Students Union has been participating on the National University Sports for the past years achieving great success. It is recognized as an institution of Public Utility which completes, in 2011, 20 years of existence. EUSA Executive Committee is represented by Mr. Oleg Matytsin and Technical Delegate was Mr. Andrzej Hrehorowicz. 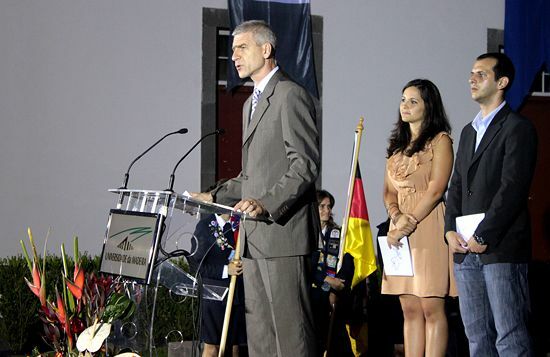 The event concluded on July 23 with an Closing Ceremony at Pátio dos Estudantes (Students’ Courtyard), in the University of Madeira’s rectory building. In the men’s team competition, the title of champions went to Józef Rusiecki Olsztyn University, from Poland, who has won a thrilling final match against Russian State University for the Humanities, from Russia. In the women’s team competition, the title of champions went to Kazan Federal University, from Russia, who has won a thrilling final match against the University of Warsaw, from Poland. Apart from the teams competitions, the audience saw interesting finals in men’s and women’s doubles, mixed doubles and men’s and women’s singles competitions. 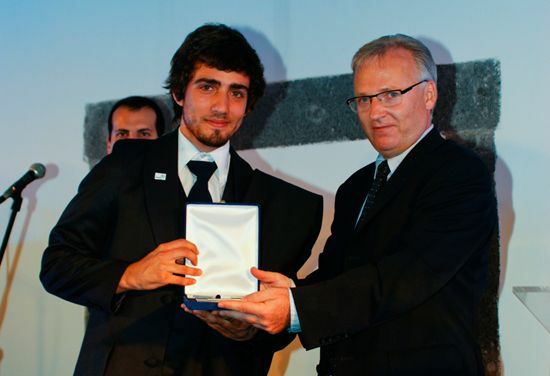 Medals and awards were presented by EUSA’s technical delegate, Mr. Andrzej Hrehorowicz, by the Head of the Regional Youth Board, Dr. Jorge Carvalho, by the President of Madeira’s Table Tennis Association, Dr. Juan Gonçalves, by the President of the Portuguese Table Tennis Federation, Dr. Carlos Leon, by the Portuguese Academic Federation of University Sports’ representative, Mr. Pedro Almeida, by the Chairman of the Organizing Committee, Mr. João Baptista and by the Treasurer of the OC, Mr. Nuno Rodrigues. Later, at the Closing Ceremony, all participants were invited to gather at the University’s Rectory building to conclude the 5th European Universities Table Tennis Championship and also to socialize during and after the gala dinner. 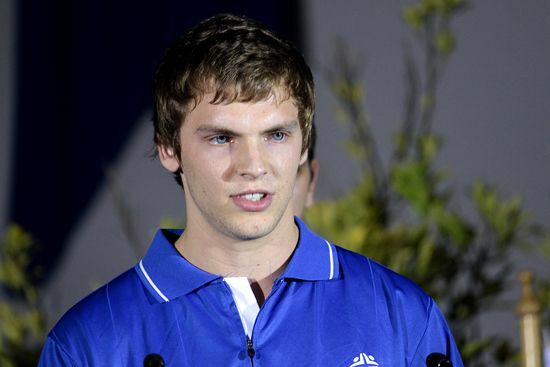 Every University who participated in this Championship was honour with a round of applause; the President of the Organising Committee delivered a speech followed by the handing out of a few gifts to the members of the Honour Committee, to the EUSA and FADU representatives; EUSA’s Technical Delegate, Mr. Andrzej Hrehorowicz, also gave a speech where he thanked all the work the organizing committee did and also offered a few gifts in name of EUSA to the Rector of the University of Madeira, to the Portuguese Academic Federation of University Sports representative and finally to the Chairman of the OC; followed by EUSA’s anthem. 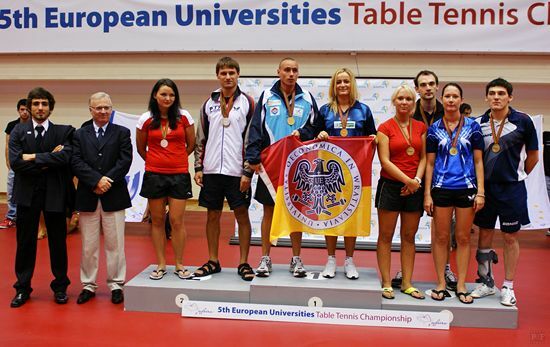 Although the next EUC will take place in Turkey in 2013, table tennis will be featured in Cordoba, Spain from July 13th to July 24th and all teams are warmly welcomed to join the 1st European Universities Games next year. 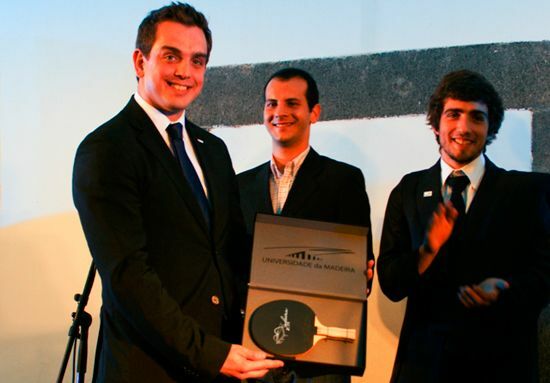 More information about the 2011 European Universities Table Tennis Championship is available online at http://madeira2011.aauma.pt.